- GM has ended its sponsorship of Survivor which, of course, has nothing to do with the show's recent announcement this year's team would be split by race. - Over at Dallas agency Dieste Harmel & Partners, Creative Director Mack Simpson tells us ECD Aldo Quevedo has moved up to President and Chief Creative Officer turning the agency into, as he says, an asylum run by the patients. - Strumpette, the proverbial thorn in the side of the PR industry, has launched a survey to determine "if the profession has the political will to make the necessary changes to move forward." 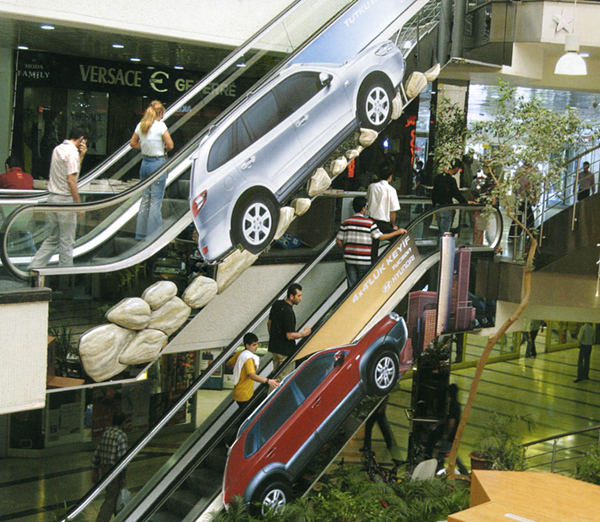 - When you shop, there's no reason a couple of Hyundais shouldn't follow you up the escalator as they do in this Istanbul mall. It's well known we in the ad business are just a bunch of Hollywood wannabes stuck creating ads when we'd rather be making movies and hangin' with the celebs. One agency got tired of its wannabe status and is making a movie. The agency is Crispin Porter + Bogusky and the movie is being scripted to take place above a Burger King restaurant. Yes, CP+B is scripting a movie which may or may not star the King. What it will do, likely, is prominent feature Burger King and, if the movie is any good, open up a whole Pandora's box of imitators. Ads promoting movies. Ads before movies. Ads in movies. An entire movie crafted to be an ad. Is anyone else pulling out their hair right now and screaming, "Stop! Stop! I wanna get off! Please! Is there life on Mars? I don't care, I volunteer to be the first!"? OK, we can't help it. We can't wait to see this movie. But CP+B really needs to come up with a Burger Queen (no the gay kind). The King just doesn't have the right eye candy qualities to attract all those 16 year old boys that frequent movie theaters. Commercial Alert has sent emails to 305 book review editors asking them not to review a teen book called Cathy's Book because it will contain product placement from Procter & Gamble Cover Girl products. There's always a mixed feeling about this. One the one hand, completely eradicating brand names from everything makes it seem as though one is living in an artificially fake world. On the other hand, reading a book is supposed to do just that - whisk one away from the stress of the real world and provide a temporary sanctuary from it all. It's a tough call. What do you think? Commercial Alert's letter is below. In a PR coup or just another disgusting manipulation of humanity to further a marketer's end, 5W Public Relations sent baby clothing from Belly Maternity all the way to Africa so Brad Pitt and Angelina Jolie's baby Shiloh Jolie-Pitt could wear it thus allowing the brand to appear in just about every publication known to man. With price wars in play over images of Shiloh and New York Magazine writing, in a stretch, "Not since Jesus has a baby been so eagerly anticipated," it may just be a pretty good PR coup. 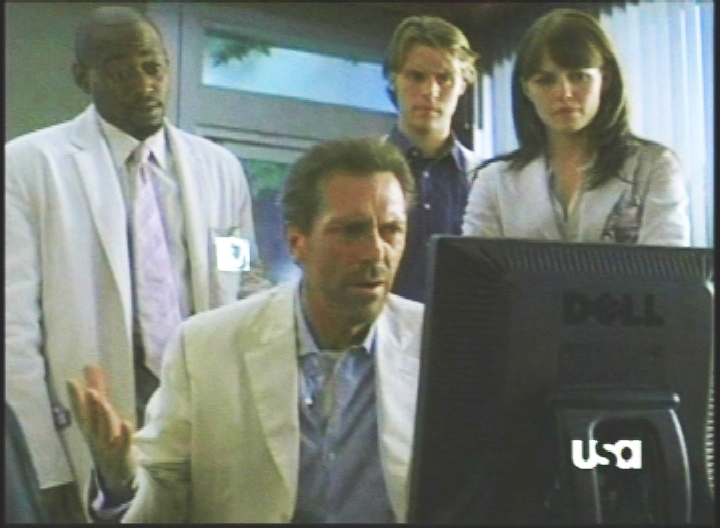 That is, if anyone takes a microscope to the images and tries to find the brand name on the shirt. Be sure to read the ego-infested, chest thumping press release from 5w, reprinted in full over at Gawker. A recent Association of National Advertisers survey found 66 percent of advertisers involve themselves in some form of branded entertainment. Eighty percent use television as the channel through which to launch branded entertainment initiatives and 76 percent plan to include those initiative in their upfront dealings with broadcasters. While marketers acknowledge impact on sales is of great importance and are measuring their efforts, 62 percent say it is not easy to do and 87 percent say existing measurement tools can't do the job. Sixty two percent say the money to fund branded entertainment initiatives comes from television budgets, up from 52 percent last year and more (35 percent) are funding initiatives incrementally, up from 18 percent last year. More than half (60 percent) do not rely on their agencies for branded entertainment and initiate projects themselves.